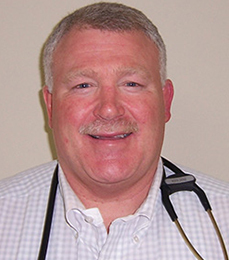 Dr. Lawrence Cox is a board-certified osteopathic physician. He has been seeing patients since 1993. His practice joined FPC in June 2013. Dr. Cox treats the entire family with a mind/body/spirit philosophy. He also uses holistic medicine and osteopathic manipulation in his daily practice. Dr. Cox is actively involved in the academic area of medicine and has been teaching medical students, interns, and residents since 1997. He gives lectures annually to residents regarding osteopathic manipulative medicine. Dr. Cox is originally from Lock Haven, PA. He moved to the Harrisburg/Lewisberry area in 1991 after medical school and has been active in the community ever since. He has been involved in the local Little League, soccer, wrestling, and football associations, and he currently serves as the team doctor for the Red Land Midget Football League and Center Dauphin School District. He also directs the Patriot Football Camp for youth ages 5 to 14 and performs physicals for hundreds of young athletes from local leagues every year. In addition to his elementary and high school involvement, Dr. Cox is involved with the PIAA as a game/tournament physician and has been a physician for the prestigious PA Big 33 game for many years. He is also a certified boxing ring physician, working for USA Boxing and the NCBA. He has covered many national championships traveling with USA boxing teams all over the world. In addition to sports, Dr. Cox enjoys travel and camping. Dr. Cox is married to Brenda, his high school sweetheart, and they have four children, Terra, Michael, Luke, and Matt, as well as 6 grandsons (so far)! Dr. and Mrs. Cox are members of New Life Church in New Cumberland, PA.